The vertex click pen has the smoothest, quietest click mechanism around. The unique styling (hexagonal final and nib section) gives this pen a very industrial, masculine look. 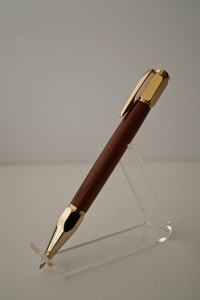 The long barrell shows off the beautiful rosewood chosen to adorn this pen. This is a kingly gift and a joy to write with. The pen accepts a parker refill and comes with a high quality tungston ball refill.